The MBTA has announced two options to deal with its $161 million dollar shortfall. Option One will deplete your Charlie Card much faster while getting you to your destination more slowly than now, but better than Option Two. Option Two hurts your wallet less but your commute more, with smaller fare increases but massive reductions in service. 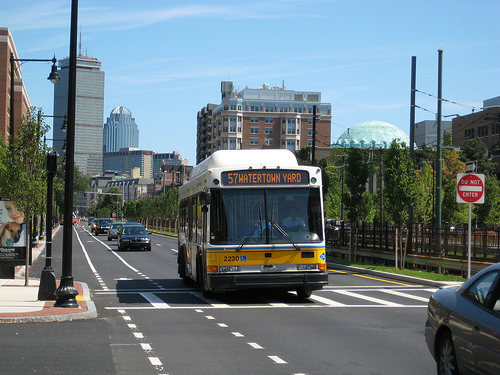 If the more severe service cuts are implemented, Allston Brighton will lose the 64, 501 and the 503 bus lines. If that happens, good luck getting on the 57, never mind getting a seat. Imagine everyone who needs to get downtown having to rely on it. Option One: Bigger fare hike, maybe you can fight your way onto the bus. Maybe all those new bike lanes were part of the plan. Contact your state legislators and let them know you don’t want to have to endure hell on wheels. Don’t forget Governor Deval Patrick appoints the MBTA board and general manager. The T is also soliciting opinions.